Our customer is an Ohio-based pool-servicing contractor that repairs and improves pools and water slides throughout the United States. As a Sure-Foot reseller they place custom orders to fit the specific need of each of their clients and projects. One of their clients is a municipal indoor pool/water slide facility. 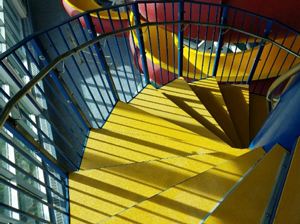 During a tear-down/rebuilding project of the water slide (platform and angled stairway leading to the water slide), the facility manager inquired about safety issue for hundreds of children who run up the stairs each day. Water from the slide caused the steps to be constantly slippery. Minor injuries were not uncommon. The city wanted an affordable, safe, long-term solution for the potentially hazardous situation. A durable product was needed to withstand foot traffic and pool chemicals while still being gentle on the tender bare feet of the children who use these steps daily. A custom solution was required because of the odd shape and sizes of the steps that were built into a spiral stairway for space efficiency (see images above). The reseller contacted Sure-Foot to get the best product for his customer. The city considered our anti-slip tape treads as an inexpensive option. But that wasn’t a good scenario because of the amount of traffic and chemical exposure. Instead, Sure-Foot recommended their fire retardant fiberglass (FRP) step covers with fine-grit texture. Originally designed for decks and boat docks, the smaller cylindrical grit is designed for barefoot traffic and water displacement to prevent slippery surfaces. 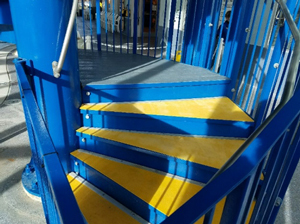 Provided with the measurements of each step in the circular stairway, Sure-Foot produced over 50 custom fiber glass step covers with a solid yellow surface for the water slide system, which were installed by our reseller. Installation went according to plan because the panels were made to the exact dimensions provided by our customer. As one can see from the images above, the water slide steps are now brightly colored and add a higher level of safety to the pool facility. The fine-textured surface of the steps now prevent slippage and water accumulation for much safer water slide access. Both the reseller and municipality are very pleased with the solution Sure-Foot has provided. A three-year warranty accompanies our FINE-Grit Coated FRP Panels, but these should last much longer since bare feet are far less likely to damage treads than heavy boot traffic. A low-level power washing is all that is needed to keep the treads clean over time. Please contact Sure-Foot with any questions about this case study, or to learn more about our non-slip safety products and customized solutions. Take a step in the right direction with Sure-Foot!